Diminutive little Freyja may not look it, but she is six months old now, and had to have a trip to the vets to make sure there will be no other wandering stray kittens needing homes in a few months time. That was yesterday. Today she has been running around like an idiot antagonizing Arthur, and finally decided to have a rest from this on some extra-large bubble-wrap and show off shaved belly. I actually think she has barely noticed the entire episode, apart from being cross at not going outside. …cat calendars still available, click here…. 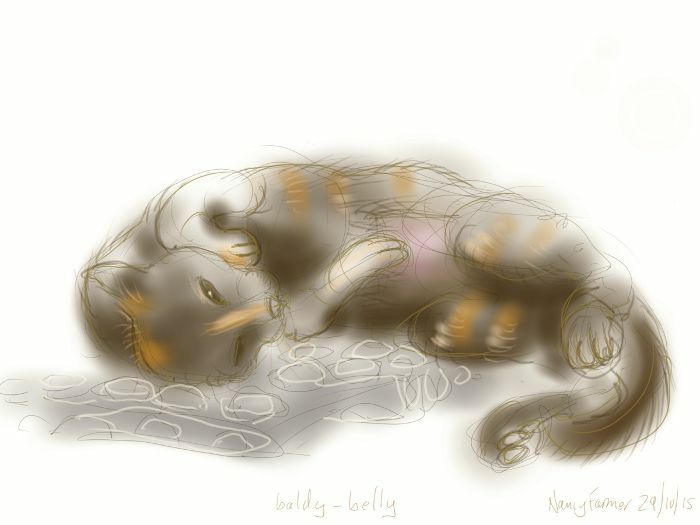 This entry was posted in Cats and tagged art, cat sleeping, cat-of-the-day, drawing, Freyja Cat, sketch, tortoiseshell cat on October 29, 2015 by Nancy Farmer. Thanks Marc-André 🙂 …and please do, I’d be delighted! Freyja is fine, I think, back shortly for a quick check-up. 🙂 glad to hear she is doing fine.